Making Money in the 21st Century! Featuring live music, keynote, free attorney on-on-ones, and expert panels packed with valuable information! Millions dream of attaining glamour and wealth through music. This book reveals the secrets of the music business that have made fortunes for the superstars. A must-have for every songwriter, performer, musician and music industry professional. The authors will sign books following their keynote presentation. This comprehensive 512 page book covers music publishing, recording, composing, contracts, royalties, song licencing, foreign income, new media, the internet, and much more! Meet Stan Soocher, who will be signing his new book, "Baby You're a Rich Man: Suing the Beatles for Fun & Profit." Part Beatles history, part legal thriller, Baby You're a Rich Man begins in the era when manager Brian Epstein opened the Pandora's box of rock 'n' roll merchandising, making a hash of the band's licensing and inviting multiple lawsuits in the United States and the United Kingdom. Panel Moderator, Cari Cohorn, Esq. How to Get Your Music in Film, TV, and Video Games: Industry professionals will provide practical advice for musicians seeking to have their work placed in movies, television shows, and games, as well as insight into the business and legal issues (and potential pitfalls) involved in such placements. Panel Moderator, Mark Pearson, Esq. An informative and entertaining look back at some of the interesting and often controversial music industry lawsuits from 2015. Panel Moderator, Edward R. Hearn, Esq. This panel will explore the issues of technology (including patents) in the creation and distribution of music, including the scope of rights for derivative and transformative works, alternate distribution options, and streaming music services and their economics. Todd & Jeff Brabec present a positive message about how to make money and succeed in the current music industry landscape. Industry professionals will discuss where we have been and where the future of music will lead both in the U.S. and throughout the world. 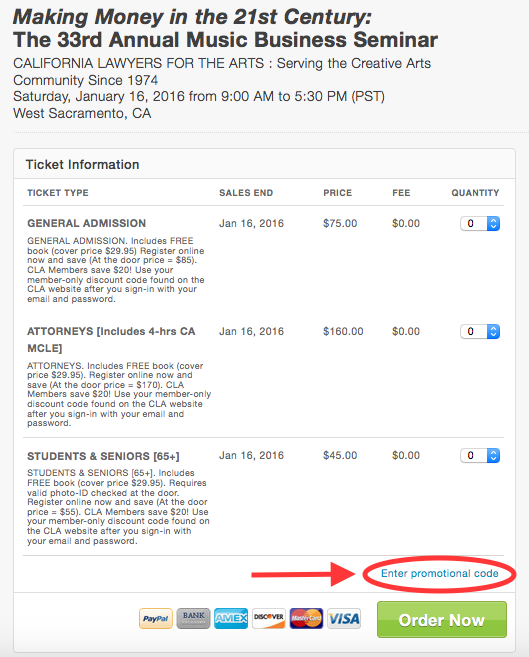 During registration above, click "Enter promotional code" to enter your CLA Member Discount Code. Your code can be found on the CLA website. Sign-in to the CLA website with your member email and password to access the code.